Coil over dampers seem to have to be very long to give a sensible travel. I chose Spax dampers* (see footnote) with 1.9mm OD springs. The dampers have an extended length of 19 inches with a travel of about 5 inches. The installed length of the spring is 11 inches. 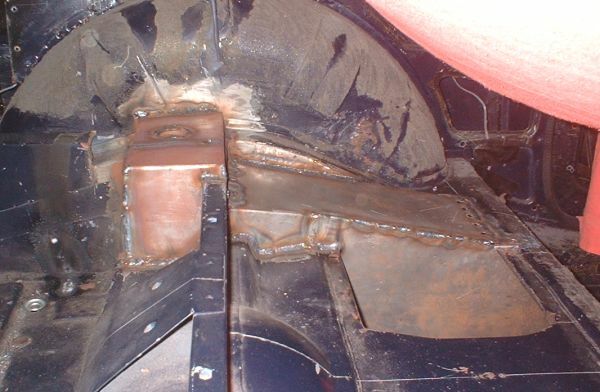 I positioned the base of the damper at roughly the same height as the base of the differential, and the top of the damper is mounted at the same level as the top of the wooden boot floor. This means I will have to make a hole in the carpet for the bolt. 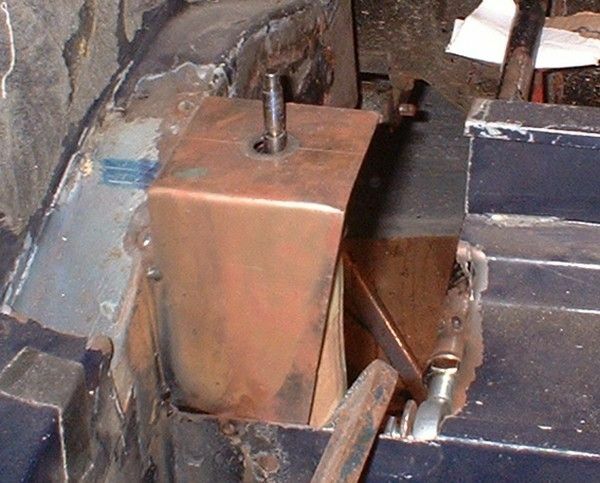 This damper mounting bracket is mounted to the side of the chassis and the front of the boot floor. 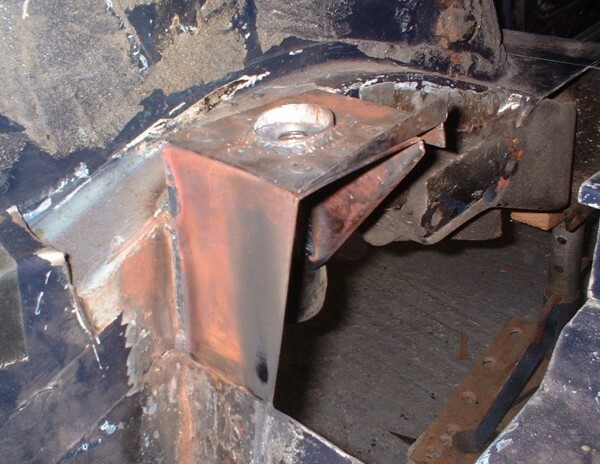 The rearward face of the bracket continues downwards to form part of the mounting for the Panhard Rod. A great deal of steel has been cut away to clear the upper arm (just visible in the photograph under more steel that will be cut away). I plan to allow clearance for 3 inches of upwards suspension travel from the normal ride position, and will add a further inch of clearance in case I ever decide to lower the car. I added a second skin to the top of the mounting to increase the total thickness of the damper mounting face to 4mm. This skin also provides location for the cover. 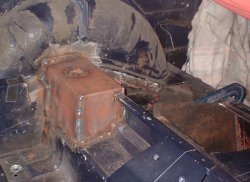 The second skin is plug welded to the first in 9 places, and has a circular section which will be welded to the cover to further increase stiffness. The damper tower nearing is completion. 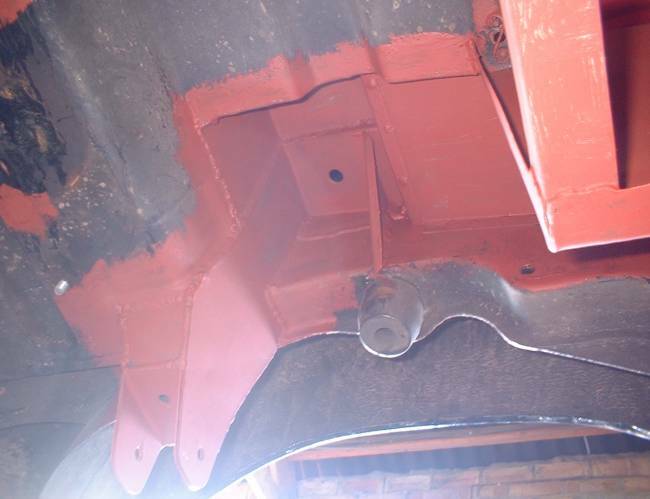 The cover also provides clearance for the upper arm and the top is level with the boot floor. I will need to shorten the piece of plywood that goes across the car in this area. I will also need to add a mounting flange for the plywood. The new side for the battery tray can be seen in the photograph. 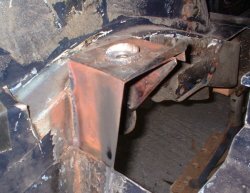 All that remains is to weld in new metal to form a raised seat base (and do the same to the other side). *Well the Spax dampers lasted only 2,000 miles. Never again! I'd thought their only problem was with the adjusters getting seized up, but I was a little worried about the spec curves being a little race orientated (difficult to tune for comfort). Konis next time - they are always good (so far).